It seems like nearly every agilist today is a "coach". What makes us different is that we've been "doing Agile" and successfully coaching teams and organizations for over 15 years. That experience makes us one of a handful of exceptionally experienced, pragmatic, and nimble agile coaches. Not Everyone is a "Coach"
We want you to realize that we are different. We have over 15 years of in-the-trenches agile experience at all levels of the organization. We've coached individual teams, technology groups, and entire organizations. And we've been successful at assisting teams to achieve the consistently high-performance levels that are the hallmark of solid agile teams. We're not just any agile coaching and consulting firm. We've got the deep and varied experience that drives results. And all of our partner coaches bring this variety and depth into play for our clients. We think it's one of the things that truly differentiates us from the crowd. Bob is also a Certified Enterprise Coach (CEC), one of approximately 90 on the planet. That credential amplifies not only our general coaching experience, but our ability to coach at the Enterprise or Organizational level. Please read our article on: How to select an Agile Coach . We think it's an even handed view to the critical selection factors in finding a great guide for your agile journey. And here's an overview of our Agile Coaching practice. We've found that after some initial training it's best that an agile team "dive in" and start iterating on their work as soon as possible. However, to be most effective they need some guidance along this path until they get comfortable with their agile techniques and team behaviors. Since agility has very little prescriptive guidance for what to do, we've found this coaching phase to be critical for team & organizational success. We speak in terms of this as a "Coaching at the Endpoints" model, meaning - the most effective times to interact and adjust your agile approaches are at the beginning and end of your iterations. To that end, our coaching involvement is part-time and focused there, with perhaps some sampling of team activity during the iteration so we can have some technical and team context. We'll jump-start your team, then coach them during the transition from one sprint to the next, for 2-3-4+ sprints. Once they start gaining confidence and showing solid results, we tend to back off in the coaching. Leaving the team or teams to continue their journey. Afterwards, we prefer to periodically check-in and assess your progress--providing ongoing guidance. We feel this "light touch" model better aligns with the spirit of agile self-directed teams and their continuous improvement. As you see in our coaching overview, we prefer coaching all 3-levels of the organization. This is truly the only way to achieve a balanced agile transformation. We leverage the Leadership Agility 360 tool and our Certified Agile Leadership (CAL-1) certification class as an entry point for coaching at the upper two levels. Most of our coaching proposals contain a strategy that is 3-tiered in approach that we've found to be the most effective. 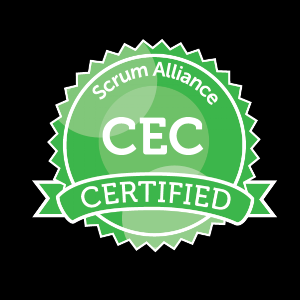 We are not a Scrum Alliance CST, so we can't run classes solely focused towards certifications. If you're interested in this capability, be sure you ask us to weave it into your coaching quote.